Be sure to stop by my Facebook page today for a 24 HOUR ONLY FLASH GIVEAWAY from Pick Your Plum! 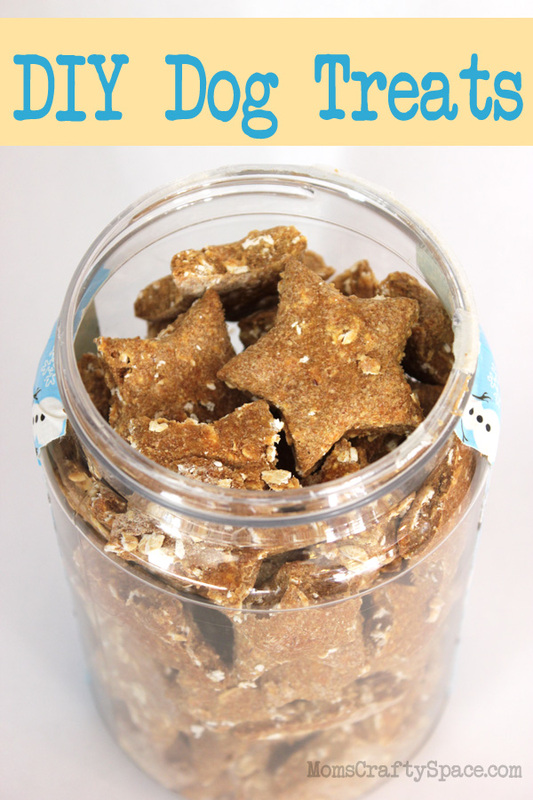 Making your own dog treats at home couldn’t be any easier than this simple three ingredient recipe! 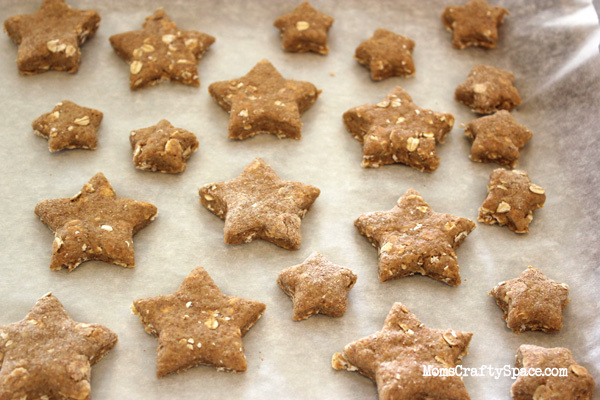 Mix together: 2 cups of whole wheat flour, 2/3 cup rolled oats, 2 (4 oz.) jars of baby food until a dry dough is formed. We used organic turkey and chicken baby food, but there are lots of great options available that dogs will eagerly gobble up. Get creative with your flavors, but be sure to consult Pet Education for a list of foods to avoid feeding your dog (some human foods are toxic to animals, so please check first!). 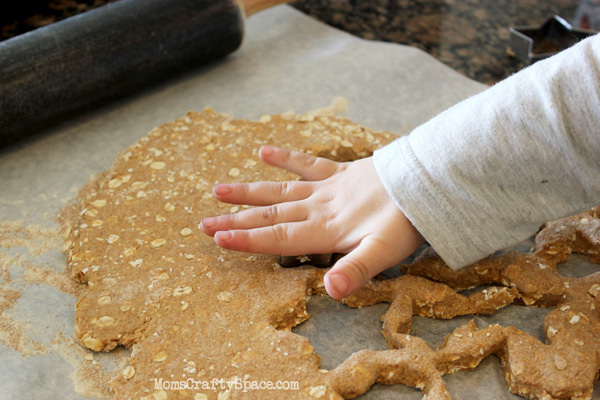 Just roll out the dough and cut – a cookie cutter (preferably in the hands of an adorable two year old!) is great for fun shaped treats, but if you’re in a hurry a pizza cutter makes quick work of cutting a bunch of small squares. Bake at 350 degrees for about 35 minutes or until treats are dry and hard. 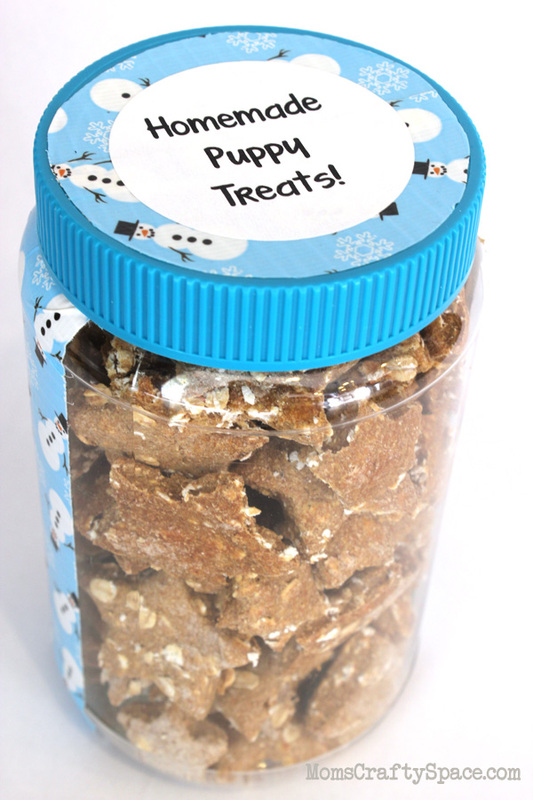 Add a label to a clean recycled jar, and it’s ready for gifting to your favorite canine friend! Since these are made with perishable food (turkey or chicken), how long are these safe to store? The longest we’ve ever had our treats was about two weeks before they all got eaten up, but they were perfectly fine that entire time. You can prolong the shelf life by storing them in the refrigerator. Just made these for my pup, Benji! Mine needed a little extra baby food to hold the dough together. I cut the dough with dachshund and bone shaped cutters. Benji can’t wait to share these treats with his friends! Thanks for the recipe! If you Dehydrate them instead of baking them they will have a longer shelf life…..
what a great idea! thank you…. I just made these and they turned out really well. I made one batch with turkey medley baby food (turkey, apples, carrots) and baked it for 45 minutes, until hard. I made a second batch with carrot baby food and baked it for 55 minutes. I just used a pizza cutter to cut the rolled out dough into small squares, as I am using them for training treats. This recipe is very easy to make and I know I will be making another batch soon. Thank you for the wonderful recipe! You can use canned pumpkin. Dogs LOVE it. I make a batch of these every week for my dachshunds. My recipe doesn’t call for oats, though. Just the flour and baby food. I usually add just a little water, too. Also, if I have it, I add snipped parsley since it is supposed to help with doggy breath. One batch lasts my 2 guys about 8 days. When I make them, I divide them in 2 ziplock bags and freeze one. Then when the first bag is empty, I pull it from the freezer. I have had these get moldy in a week otherwise.